Both our lucky winners are kitty-moms to three cats who will soon be fighting over all the cool goodies they'll receive in their Pawalla Boxes of Joy. We want to thank all of our sweetheart readers for entering the contest and helping get the word out. And we'd like to thank Pawalla for providing the loot! WAFFLES TOO: Um, hi everybuddy. Waffles Too here. While Sue and Nicole were bizzy winning the Pawala prize, the Boss and me were winning stuff too! Just look at all the cool awards our friends have given us! The Boss says I was suppose to member the rules for all these awards. But the only rule I member is not jumping on the kitchen counters when someone is looking. KATIE: That's just great. Do you at least have the notes on who gave us these awards? ♥ We got the Why I Love Thee Award from Nerissa's Life. ♥ We got the Liebster Award from Speedy the Cheeky House Bunny. ♥ We gots the Reality Blog Award from Feline Funnies AND The Musings of a Crazy Cat Lady. ♥ We got the Sisterhood of the World Bloggers Award from Daisy & Cress. 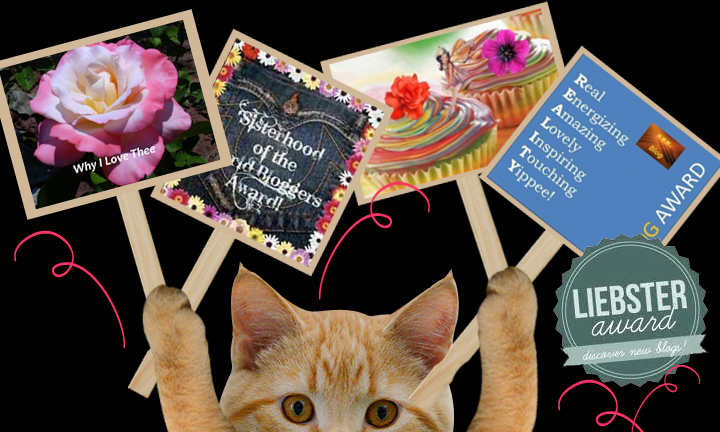 ♥ We gots the Super Sweet Blogging Award from Bark & Chatter AND Feline Funnies. KATIE: Ok, so for the award requirements, I guess we'll just have to make something up. How about I ask you THREE QUESTIONS and you give me your answers? KATIE: Ok, that was one. WAFFLES TOO: Um, ok. I barely member, but it was right before Glogirly came to the shelter to fall in love with me. I was still recovering when she brought me home to the Townhouse. The blogosphere thinks I'm crazy? KATIE: NUMBER 3. The blogosphere thinks you're huge. They want to know what you're eating and how much you weigh. So? WAFFLES TOO: Um, I thought you said you'd always be bigger than me? KATIE: Just answer the question. WAFFLES TOO: Um, ok. 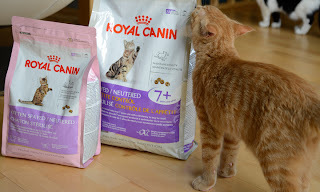 I eat the Spayed/Neutered Kitten Formula from Royal Canin. And sometimes when no one is looking I eat Katie's Royal Canin too. I get both crunchy and gooey. And I weigh 7.5 pounds. The Boss weighs 12.5 pounds. KATIE: A lady never shares her weight, Waff. And I'm pretty sure I'm only 12. Maybe 11.5 since Glogirly has been starving me watching my weight. Pee S: This isn't an ad for Royal Canin...we just love our foods. Concatulations to yous guys for all your awards! Congrats to the wonderful winners! Which one gets the Waffle box? Congratulations to the winners! And congratulations to you on all your awards!!! Hey Waffles Too, Mistletoe here. Just so there is no contusion, Katie will ALWAYS be bigger than you. No matter how big you grow, she's always going to out rank you, and you will ALWAYS look up to her, even if you have to bend over to do so. It's the big sister rule. You can't break the big sister rule or something awful will happen. If you need any guidance on this subject you can talk to my little brothers, Tiger, Pumpkin and Hitch. You be a good kitten and listen to your big sister. Remember, Katie always knows what's best for you. 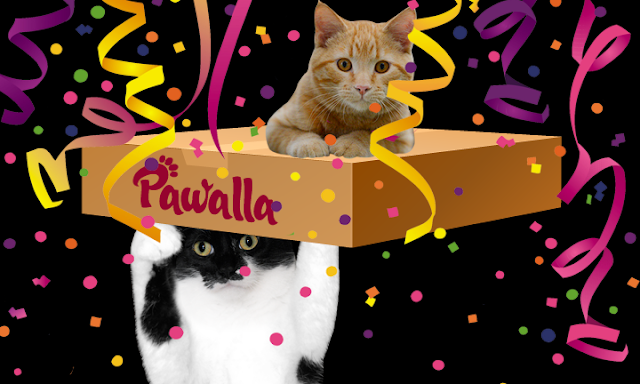 Concats to the winners of the box and to you guys on your pawsome awards! You're just going to be a large handsome mancat when you grow up Waffles. Concatulations to the winners - and concatulations on your awards! Wow, Waffles is two pounds heavier than little me! Concatulations to the Island Cats! Katie, is Waffles being mailed out with that Pawalla box? Hey, that is interesting that there is a special food for spayed and neutered kittens! Concats on all of those awards!!! And concats to the winners, too! Congratulations to you on all those awards. Happy Valentines Day for yesterday. Concatulations to the goodie-winners & to y'all fur your awards!!! Great answers Waffles! Have a good weekend! Congratulations to the winners. And to the both of you on your awards! Waffles, don't worry about remember rules and things about those awards. We rarely remember those things either. Concats to the winners! Wow The Island Cats sure are lucky this week, they won a give-away on my blog too! Concats to all the winners & concats to you guys for your awards! You deserve 'em! Congrats to the winners and great answers! Concats to the winners!!!! Waffles, we don't think you are crazy...well maybe just a little bit. Aren't all kittens just a wee bit crazy? It's allowed. 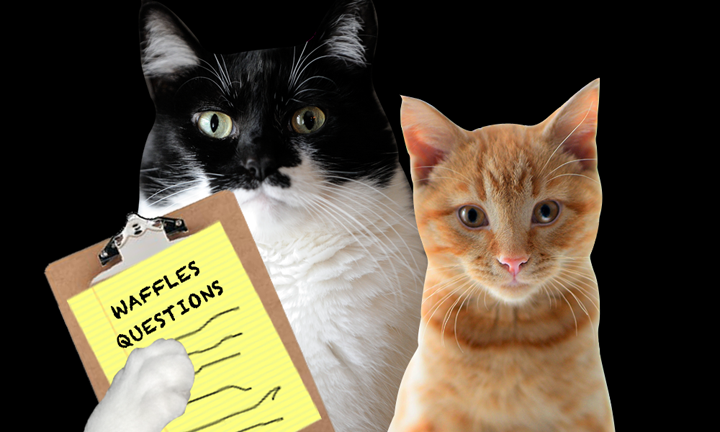 Waffles Too, a few weeks ago I don't think you would have been able to answer even those questions with a complete sentence. The little guy is growing up--but not fast enough for Katie, I'm sure! Congrats to the winners, they will enjoy their Pawalla boxes for sure! And congrats on all those awards, too! We're just checking in...Mommy has been a real butthead this week and "too busy" to comment for us. Do you need a used Mommy? Glogirly could utilize her to scoop and tow Waff around in a wheelbarrow. That boy is gonna be HUGEAGANTIC. Hooray fur da winnersmand congrats on the very nice awards! Concats to the winners. Waffles needs to understand what an interview is! Concats to the winners, and concats on all your awards. Allie: *Gasp! * He did NOT just state your weight (which was OBVIOUSLY doctored in a maliciously little-boy manner, might I add). Congratulations on your bevy or awards - AND to the Pawalla winners! OMC! Lookit all the awards! How long have you been collecting them??? Concats to your winners. I never win nothing. Sob!